It looks like the Zoo has been closed. CBS has decided to cancel their low-rated Zoo TV show after three summer seasons. A CBS drama thriller based on the James Patterson and Michael Ledwidge novel, Zoo, stars James Wolk as zoologist Jackson Oz. The cast also includes Kristen Connolly, Nonso Anozie, Billy Burke, Alyssa Diaz, Josh Salatin, and Gracie Dzienny. After noticing animals behaving strangely during the African safaris he conducts, Oz and his team work to figure out the reason behind it. Meanwhile, the animals assaults become more cunning, coordinated, and ferocious. The series never drew a big audience for the network but it managed to hold on for three seasons. The first season averaged a 1.06 rating in the 18-49 demographic with 6.40 million viewers. The second season dropped by more than 30%, averaging a 0.74 in the demo with 4.45 million. This past summer, the third season saw even bigger declines and averaged a 0.51 in the demo and 2.65 million. Zoo was produced in-house by CBS Television Studios. It was profitable thanks to a deal with Netflix to stream the show once its seasons finished airing. Because of the deal, the series was profitable before an episode had even aired. 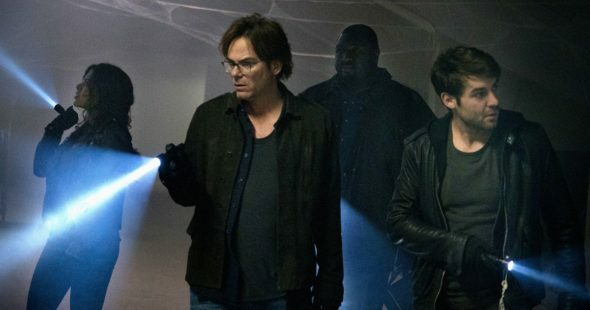 Salvation, which was recently renewed for a second season, is part of a similar deal with Amazon. What do you think? Did you like the Zoo TV show? Do you think that CBS should have cancelled it or, renewed it for a fourth season instead? OMG no 4th season. I love the show, and want to know what happens. You can’t stop at a cliffhanger. I hope the are going to reconsider because alot of people love the show. There are alot of people that watch the show on Netflix of somewhere else. So you can’t know the real results. !!!!!!! !ZOO was the best show I’ve actually seen in along time !!!!!!! Oh. I am so pissed. I finally got around to watching some flicks over the holiday break only to want nothing more than to see Abigail pay for her psychopathology. Then I find out that Zoo isn’t going to be concluded! What a major disappointment. If CBS does this with Star Trek: Discovery, unlikely as that might seem, I’m done with them. Finish what you start. I hope CBS will consider doing at least a single or dual episode finale similar to what happened with Farscape.